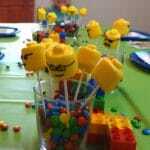 Hosting a Lego party? 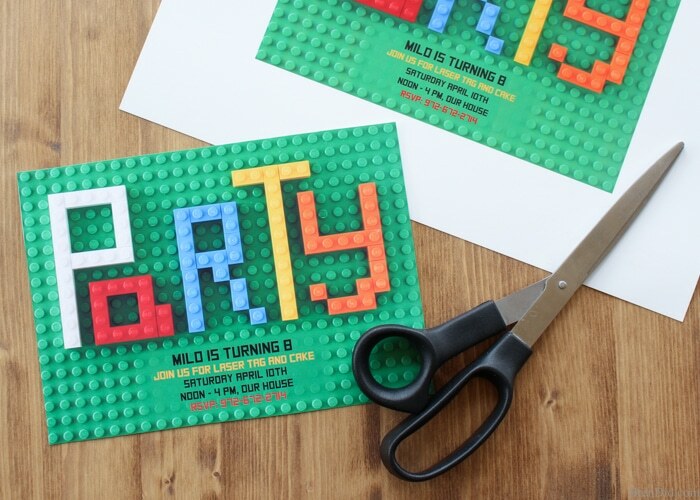 Follow this easy tutorial to learn how to make Lego Party Invitations. 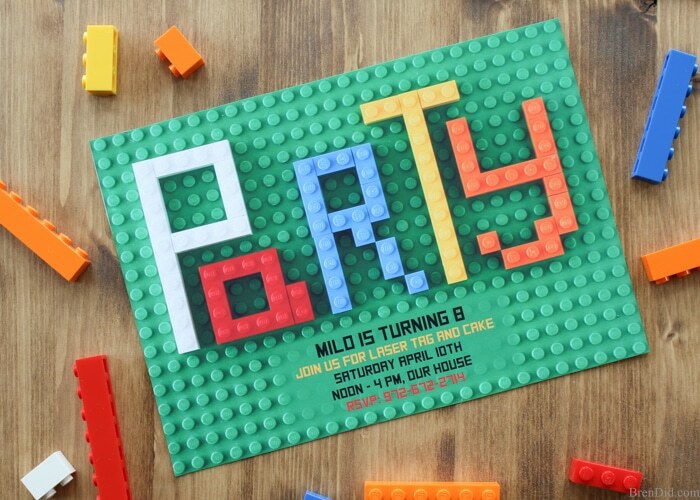 Custom birthday party invitations can be adorable and frugal. I have Martha Stewart taste with a Dave Ramsey budget… Champagne dreams with beans and rice buying power… Architectural Digest desires with IKEA funds. It’s not that I couldn’t spend the money… it’s just that I’m naturally frugal. One example, I was completely enamored by engraved invitations when my husband and I were planning our wedding. Their crisp linen paper and classic lines called to me like a sirens’ song…until I noticed the price. Nearly $15 per guest! Their beckoning call was immediately squelched. But I didn’t give up entirely. I dug and searched and made calls until I found a mail order printer that could make nearly identical invitations for a tenth of the price. The irresistible pull of the sirens’ song reemerges when I am planning kids’ birthday parties. I long for an elaborate magazine-worthy celebration, but my desires are mostly silenced by my frugal nature. I haven’t given up on birthdays entirely, I still love elaborate parties. I simply find ways to create the custom look for a lower price. Luckily, with a few free tools you can make custom party invitations yourself. 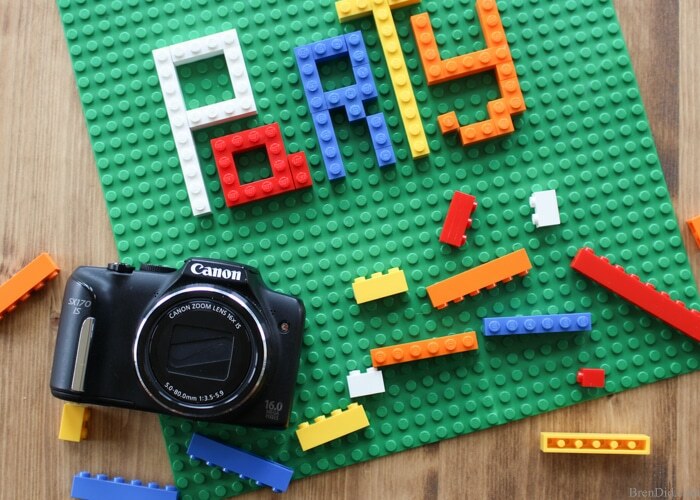 These custom Lego Brick invitations use a camera (or camera phone), a few Lego pieces, and a desktop printer to create custom invitations that cost about $1.50 (including envelopes). 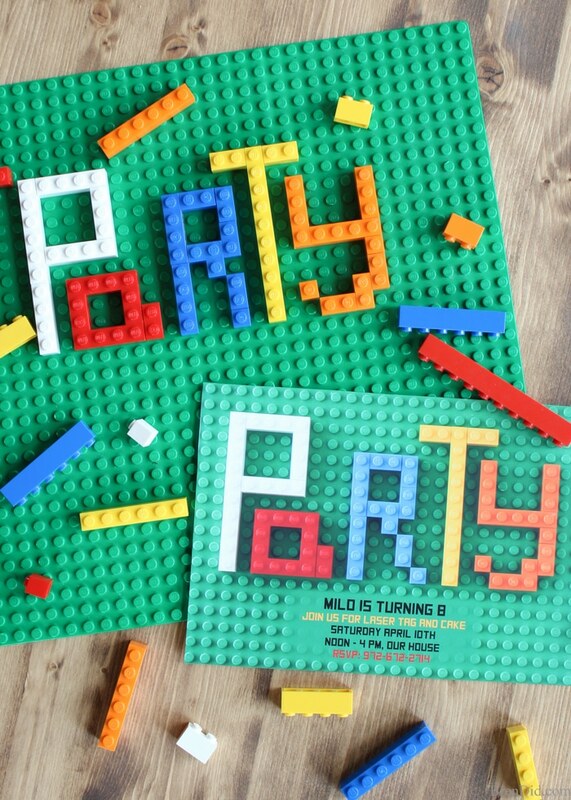 Follow this step-by-step tutorial to make Lego Party Invitations. 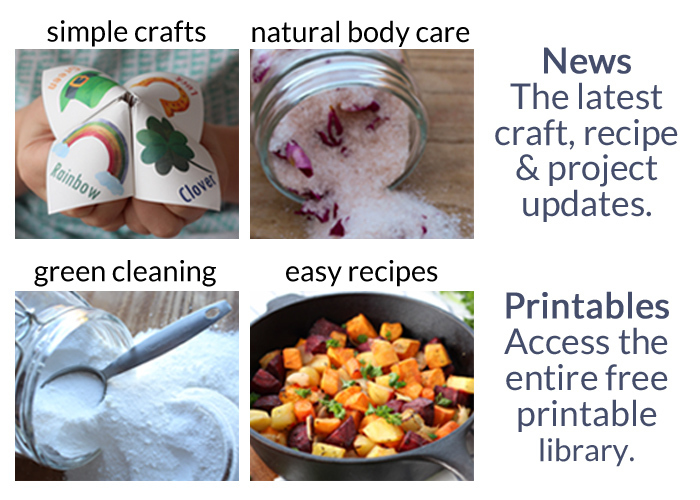 (If you prefer my version you can also download a free editable PDF from the free printables library). 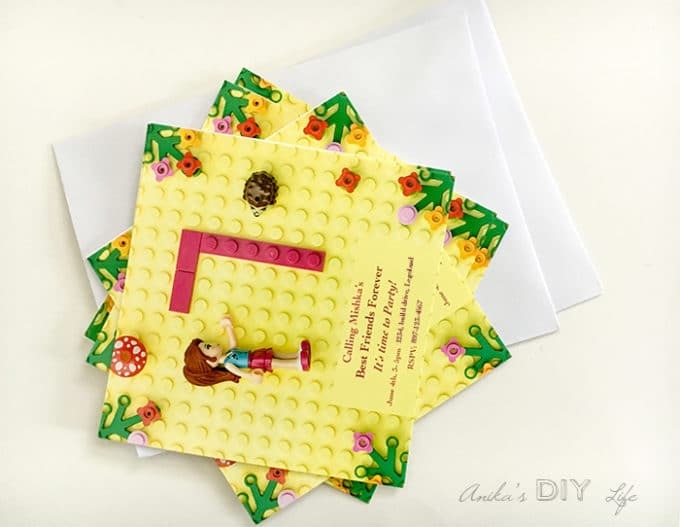 2 – Build the Invite – Use a Lego base plate and bricks to create a basic design. Use the word “party,” a child’s name or their age. 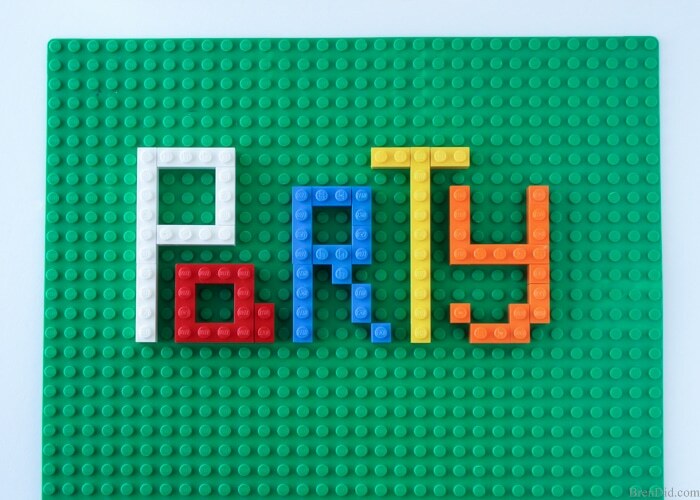 Make sure to leave space under the brick design for the party details. 4 – Pick Your Image – Download the photos to a computer and select the best image. 5 – Open in PicMonkey – Open PicMonkey.com, a free online photo editing program. Choose “edit” then “computer” and select the photo. 6 – Crop the Photo – Use the Crop button to crop the photo to the size of the final invitation. These are 5×7. 7 – Add Space for Text – Select the Overlays button then select Geometric and draw a rectangle under the Lego words. Use the color selection dropper to change the color of the box to match the Lego base plate. 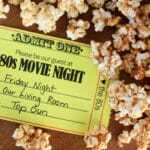 8 – Add Party Details – Select the Add Text button to add text. Select “SquareFont” as the font, type in the invitation details. 9 – Make it Pretty – Highlight the text then format the text color and size as desired. 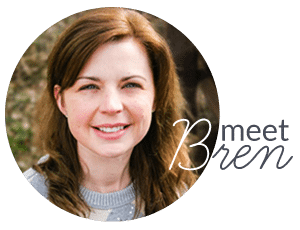 10 – Save the Invites – Save the image to your computer. 11 – Print the Invites – Print the invitations on a home printer or use an online photo store to print 5×7 copies. 12 – Enjoy – Send your invitations! 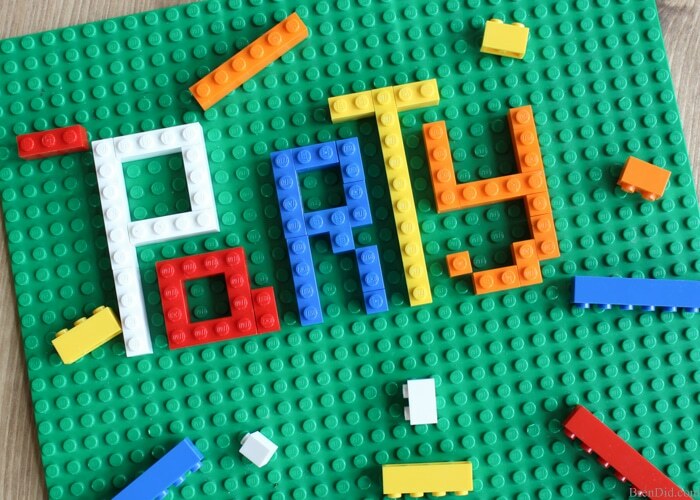 Lego has tons of creative sets that make great party themes. 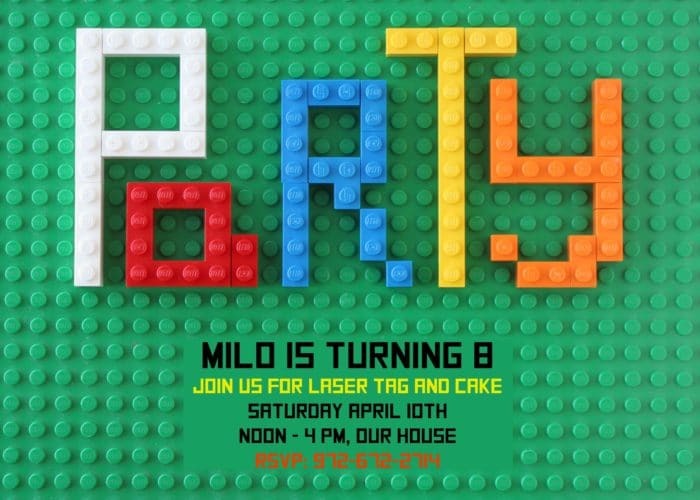 My friend Anika, from Anika's DIY Life, made these adorable Lego Friends Party Invitations for a recent birthday. 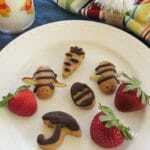 Check out the easy tutorial. 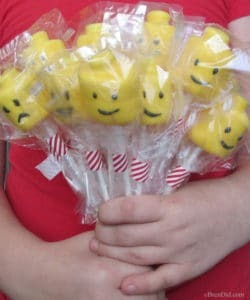 1 – Lego Head Marshmallow Pops they double as party treats and centerpieces. 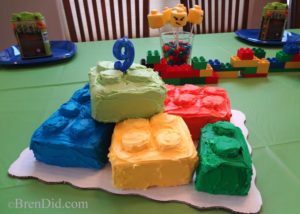 2 – A homemade Lego Birthday Cake and Lego Blocks are perfect table decorations. 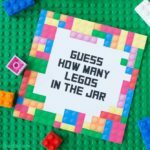 3 – Lego entertainment is easy with Netflix. 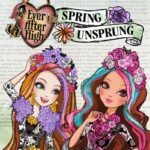 They have shows that are perfect for any Lego theme from Lego Bionicle to Lego Friends. Congrats on being selected for the Stream Team Spotlight! This post rocks! Thanks Brettni! I love yours too! “Architectural Digest desires with IKEA funds” LOL — exactly how I feel when I want to redecorate my apartment <3 These are super cute invites – you rocked it!